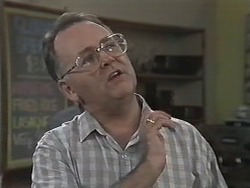 Harold catches Gloria allowing a customer to drink alcohol in the Coffee Shop. Gloria tells Harold it's not how it looks and offers an explanation - she wasn't serving Bob a beer, she was confiscating it. Harold doesn't believe her and tells her off. She has to admit that some of her Waterhole regulars followed her over when she took over the Coffee Shop. But she never served them alcohol, she just turned a blind eye when they brought their own in. Harold is incensed and says he would be fined if the Licensing Board found out. Gloria promises it won't happen again. Harold says he knows it won't - because Gloria is sacked! She hangs up her apron sadly. Dorothy is considering redecorating while Ryan and Lochie sit round on some of the moving boxes. Dorothy picks up one of her masks and tells them about the time she was hiking through New Guinea. Ryan doesn't think Joe will ever shift the fence. Just then, Dorothy hears a noise. DOROTHY: What is that man up to now? Joe is planting bushy plants along the fence line. Kerry thinks both Dorothy and Joe are being petty. 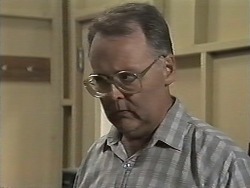 Matt comes up and tries to reason with Joe - he suggests Joe tries talking to Dorothy. JOE: Talking to her? Talking to her?! I'd have more luck trying to talk sense into a mad dog! (To Bouncer) No offence, mate. Just then, Dorothy comes up. 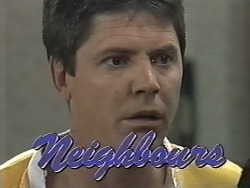 DOROTHY: Mr Mangel. Are you planting trees? JOE: No, I'm building a block of flats! Dorothy thanks him for the kind gift - he'll be handing it over to her soon. 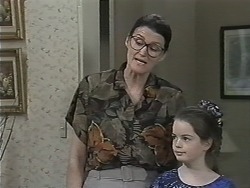 Dorothy suggests that Joe gets a good lawyer as she's going to fight for what's hers. 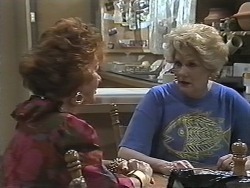 Gloria is telling Madge that Harold has given her the push. Gloria didn't mean any harm, she was just trying to keep the customers happy and it got out of hand. 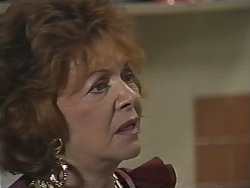 She asks Madge to talk Harold into giving her her job back, but Madge doesn't hold out much hope. In the living room, Joe apologises for carrying on about the fence. He'd like to come to a compromise with Dorothy. He suggests that he'll maintain her garden for nothing, as long as she keeps the fence where it is. Dorothy says that gardening is a passion of hers - she loves it. Also, she wants to grow her own vegetables. Joe suggests that Kerry will give her vegetables from her own patch. But Dorothy just wants Joe to shift the fence. DOROTHY: Mr Mangel, do not come in here threatening me with a limited vocabulary and mixed metaphors, your time would be better spent moving the fence! Good day. JOE: I am not moving nothing, nowhere, never, you hear? 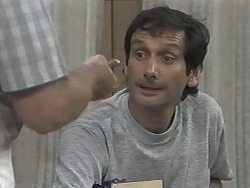 DOROTHY: Mr Mangel, you are not moving anything, anywhere, ever, you hear? She closes the door leave Joe looking bewildered. Melanie is hanging out with Kelvin - she's already missing Des and Jamie a lot. She says lonliness makes a person go quite strange. Kelvin says that maybe she could invite the twins round for dinner. The shop is full of girls who are giving Ryan a hard time again. They turn up the juke box and Ryan turns it down again. Harold comes in and tells them off. In the kitchen, Harold tells Ryan that he has to be firmer with the girls - he let things get out of control. 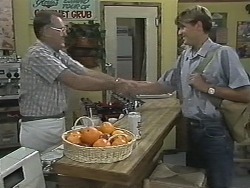 Ryan promises to do better and Harold agrees to give him one more chance. Melanie is stretching Kelvin's legs for him. He tells Melanie that she's given him such confidence - he feels he can take the world on now. Melanie says that Kelvin is very special. Kelvin says he's going to make up for lost time now he's found his confidence. MELANIE: Who would have thought that my secret admirer would turn out to be Mr.Right after all! Madge and Gloria come in. MADGE: Hello, oh merciful one! Before she can say anymore, Harold says he might have been a bit hasty letting Gloria go. He starts asking her about the catering order for Des. Gloria says doing it do cheaply relied on a family secret. Paul comes in and offers Gloria her job back at the Waterhole. He says Gloria's customers seem to follow her wherever she goes! Harold blusters that he's just offered Gloria her job at the Coffee Shop back. They get into a bidding war(!) Paul finally wins, offering Gloria $15 an hour. Joe and Kerry are doing exercises when Dorothy and Lochie come round. Dorothy says that maybe they can work out a compromise. She says she's now prepared to sell Joe the land. DOROTHY: Thirty-two metres of prime real estate - how does $20,000 sound to you?